Other readers who were not directly involved in the fatal crash of September 23, have experienced Flying Tiger Lines. All of them, of course, had the experience of flying and landing safely**. It was September of 1962. I was 9 years old. My father was in the USAF. We started our trip at McGuire AFB and landed at Prestwick, Scotland, to begin my father’s three-year assignment at Kirknewton AFB. I remember, even at that early age, how unusual our plane looked, with its big three piece tail, and how scared I was to first board it at McGuire and how relieved I was to get off of that plane in Scotland. It was the Flying Tiger 923! How close we came to being part of a disastrous event. My heart goes out to everyone aboard that ill-fated flight. Today is the first time I have read about what actually happened those many years ago. I hope you have had a good life sir. Bless you always. I was on Flying Tiger 923 also, in 1962, but my story is different. Coming from Germany, getting on in Frankfurt, my husband and I and our then one-year-old-baby-girl were traveling together. We got into a very bad storm over the ocean and the plane was bouncing, going up and down and made me terribly airsick. We had to emergency land at Gander in Newfoundland, where we were told there was a problem with the plane. We were given blankets to keep warm while we waited for them to repair whatever it was. Several hours later we took off again en route to McGuire Air Force Base. I looked down into the turbulent, ice-cold water and prayed to please let us make it to my new home in America. We made it by hook or by crook. It was the worst flight I have ever been on. Still airsick when we got off the plane, we made our way to the Greyhound Bus to take us to West Virginia where my husband was from and to meet his family. In the excitement of the horrible flight, I left a suitcase sitting behind. It eventually caught up with me. Well you know the rest of the story. I wished I knew the name of the nice lady across from me. She came over and hugged and comforted me and joked about my sickness. She said, “That’s why they have these paper bags here.” God bless her. The year 1962 was when I started my new life in this country. I became a U.S. Citizen and always try to contribute in every way I can to repay what I have gotten from this country. I can’t help but think that I could have been on the bottom of the ocean. It was so long ago Fred, I know, but it never will be forgotten. I was 5 years old flying from McGuire to Paris in 1962 on this very plane. My father was a sergeant in the Air Force, being transferred to Chalmount AFB. I remember several things about the flight. We stopped in Newfoundland and then made another stop in the Azores. I remember seeing the exhaust flaming all night. I had a window seat. I remember my father telling us a short time later the plane crashed on a similar trip. Luckily, when we returned to McGuire in 1966 we were on a Pan Am 707. Just thought I would share this. Below, a photo of Flying Tiger#923, courtesy of a Swedish friend, Ragnor Domstead, who was an engineering student at the time and was responsible for chartering the aircraft for a trip he took with his engineering class in June 1961. I am the photographer of the N6923C, Flying Tiger 923, that you see here. As Peter Frey (a freelance journalist) mentioned, I don´t claim any copyright, but I ask to be mentioned as photographer. It is a strange feeling to know that “our” Super Connie ditched a year later. After refueling at Shannon, Ireland, we continued our 1962 journey, but had to land at Gander, Newfoundland to wait out the weather. The whole Eastern seaboard was closed due to fog. Somewhat delayed, we arrived at Idlewild. As our study tour was a success, I was asked to arrange some more tours the following years. We had another Super Connie chartered in 1962 and a year later also. When I first heard of the Flying Tiger Line, it was in a small notice in a newspaper. It said that the Flying Tiger Line was open to passengers from the US to Europe in the beginning of the summer and vice versa at the end of the summer. They also offered cheap charter flights from Europe in the beginning of the summer and back at the end of the summer to fill otherwise empty planes. **(Foot note: The number “923” does not identify the flight route. The number “923” designates the last three digits of the aircraft’s registration number as it comes off the assembly line. This is why someone could say they flew Flying Tiger 923 in a totally different part of the world. The fact that it flew (and crashed) on September 23 (or 9/23) was simply a coincidence. Please visit “Unlucky Year for Flying Tigers” for more detail on aircraft identification. Readers have asked why the mid-Atlantic ditching of Flying Tiger 923 on Sept. 23, 1962, is virtually unknown? Publicity at the time of the crash was very minimal and what there was disappeared very quickly. So little is known about the crash that the story, as a simple matter of “historic fact,” just recently made it to the pages of the online encyclopedia “Wikipedia.” Just about anything in the world makes it to that site! In this case, it only took 50 years. I am happy to say that this site has given a degree of meaning and recognition to the event. As of Memorial Day 2017, this site has clocked a total of 81,814 views from throughout the world. The site has some 98 posts and 11 special pages, and a total of 109 separate stories. Lighthouse on September 23, 2012, showing four flags: Irish for the Irish role in the Fling Tiger 923 rescue effort, the official flag of Commissioners of Irish Lights, US flag for those on the aircraft, and Swiss, for the Celerina rescue. Why did the ditching get so little attention? Because the Army did not want attention, especially to the small contingent brand new combat paratroopers on board. The ditching occurred at the peak of the Cuban Missile Crisis in September of 1962.The American and Soviet Union leaders were hurling threats of the use of nuclear weapons if either did not get their way. That also happened to be an especially tense period in the “Cold War” with the Soviets building an 850-mile fence between the East and West. The details are pretty complicated and were highly classified at the time. The Army worked hard at keeping publicity to a minimum, especially about its quietly shipping combat troopers over to Frankfurt on planes usually reserved to transport military families and career military personnel. The surviving combat troops were not provided post medical leaves, except in very rare cases, got “free” uniform and clothing replacement and a small amount of pocket change. The combat troops who did not survive were basically forgotten. There was no official memorial or ceremony commemorating the disaster. None, not anywhere! Today the Flying Tiger 923 disaster is on the historic map, but it took more than 50 years to get it there. This is due to the interest and loyalty of followers of this blog site as demonstrated by 81,814 views from around the world. While there are no “official” memorials, we can report that in the Republic of Ireland, there is now a small memorial plaque at the Galley Head lighthouse and another small, but beautiful memorial on the Bromore Cliffs near Ballybunion golf course. These were placed by private citizens unrelated to the Army. If you have not yet explored this site, please be sure to do so. All 109 stories are accessible by clicking on the categories posted under the masthead above. The late Capt. Murray’s son-in-law, Eric Lindner, recently signed a book contract with Lyons Press to expand on the history of Flying Tiger 923. Ellen’s brother, John, in Virginia. and other involved parties, but he’d love to hear from anyone else who might have some knowledge of or insight into the events of Sept. 23, 1962 and what preceded the events of the disaster and the aftermath. Please note that materials presented for inclusion in the book must be originals, his publisher says. Unfortunately copies of copies won’t pass editorial muster, quality wise. However the material itself may provide valuable insights or information. It is time for Thanksgiving and this is my thanks! This is a reawakening of our Flying Tiger 923 memorial site, some two years since my last posting. It happens to be Thanksgiving Day 2016, November 24, and in large measure because of this memorial website, I can say from the bottom of my heart, “Thank You,” to the hundreds of folks who have contributed to my being here today. When I say hundreds of folks, I feel I am making an understatement as I have met so many of you since launching “Flying Tiger 923” in 2009. Everyone has been wonderful, including those whom I have met, those whom I have spoken to by phone and those whom I know were distant from the event but feel a part of the disaster. This includes the 1,500 Canadian sailors aboard the silently trailing, protective aircraft carrier, the Bonaventure and several hundred more serving on the five battleships that escorted the carrier. When I started my personal investigation of the crash some 35 years after September 23, 1962, I knew practically nothing about the event or the people involved. I didn’t even know there was such a thing as an aircraft carrier that was following and searching for us! The research resulted in my book, “Born Again Irish,” a story about Flying Tiger 923 and how it drove me into an interesting and diverse life. When I say how little I knew about what happened is probably the same for most survivors. No one knew much of anything. An airplane crash happening at night during a terrible storm in the North Atlantic at that time in 1962 was simply one of many events dominated by the world-wide drama of the Cuban Missile Crisis. I thought it was related to the construction of the Berlin Wall and the 880-mile-long “Death Fence” that separated East Germany from the West. Those two global dramas were related as “Cold War Events” that captured the media attention. After the Flying Tiger crash, the rescue of the survivors occurred in two separate and dramatic phases; the first at Cork, Ireland of only 19 people (which I was lucky to be a part of) and the second at Antwerp, Netherlands for the remainder of the survivors. Since I was one of the 19 combat paratroopers on board, I was of course first concerned about my Army buddies. I did not know a single non-combat passenger who made up the majority of the survivors. Considering our extremely close physical contact during those long hours in the lone rescue raft, and several days in the Swiss rescue ship, the Celerina, very little social interaction occurred, in part due to the extreme physical and emotional shock we had all undergone. For most survivors, when it was over, it was thankfully over. There had never been a memorial for the event or a reunion prior to our celebrations in Ireland in 2012, 50 years later. So now, even more years later, I say thank you. Thank you to all of you, even those who didn’t make the flight and those who lost loved ones. All the passengers on Flying Tiger 923 shared a tiny bit of time in human history. It was just a little bit of time in human history, but it was a major factor in our own timelines. I appreciate sharing a bit of it with you and thankful that I am here, at this moment in Eagle, Colorado, to say with heartfelt feelings, “Thank You All,” for being here wherever you are. I was there on September 23, 1962, a young paratrooper, headed for Germany and wishing I didn’t have to go. I wanted to stay in the states. I was barely 21. The crash of Flying Tiger 923 was a horror. It has affected my family and me far more, and for many years longer, than I could have ever imagined. The drama of the crash stretched on for hours and then into days. I was taken from the rescue ship by helicopter three days later to Mercy Hospital in Cork, Ireland, where I claim to have been “born again as an Irishman.” It was my second chance at life, beginning with my rebirth at Mercy, even though I never got to see if there was a maternity ward at that hospital. Pvt. Caruso, fresh out of jump school. the crash, other than what I believe I saw and experienced. I realized that I could hardly remember another person, no faces at all. I could remember very, very few of the details of the crash and aftermath with any degree of accuracy. And even worse, I realized that I couldn’t even expand my mind to accept the details by reading about others. I could read, but I could not see. Others hardly existed. When it came to Flying Tiger 923, it was MY plane crash and mine alone, at least inside my mind. But after all of these years, I have been waking up. While gathering information for my book and this web site, I have become aware of how many people were involved and how many and who contributed to our survival and recovery. How could I not have known? Why has it taken so long? Was I asleep for the past half century? Maybe I have finally grown up and I am ready to learn all of the facts that I can, all of the little bits and pieces I didn’t see before. This site is intended to be a commemoration to all: the crew, the rescue teams, those who survived and those who didn’t, and all of the families and friends who prayed, rejoiced or grieved their loss. This is an interactive web site. Readers can comment and contribute photos and information. This is a way of gathering stories and experiences and sharing it with who ever might have an interest. Please be aware that some of the posts may contradict details in others. This is because people’s recollection of events do not always comprise the whole story. It is human nature. Even newspaper reports contain major inaccuracies. By piecing together as much as possible, we may have a comprehensive view of the event which is much larger than any one of the participant’s view. Please add your comments. Tell us of your experiences, your memories and your questions. What is on your mind?A fifty-year anniversary is a good reason for taking a new look at this tragic and historic event which, for many, was the most significant event in their lives. If you have not yet done so, read my book and consider how this event might affect others compared to the way it affected me. This book describes how I was driven to become Irish, which was a lifelong journey, however, the first half of the book delves into the details of the horror of the crash and its immediate aftermath. It is currently out of print. but it is available on Amazon.com. As this Flying Tiger 923 Memorial Web Site meets the end of three full years of public posting of 106 stories, we take pride in the fact that we have enjoyed some 61,000 public views world-wide. At least one person from every country on earth has viewed the legacy of Flying Tiger 923. 1 – John Murray: Fate of 76 lives in Captain’s hands, 1,129 views, of which 185 were on the second posting of the same story. 2 – Pierre Andre Raymond: The Celerina’s role in rescuing a Super-Constellation at sea, 1,044 views. 3 – Carol Ann Gould: Flight attendant on her day off, 947 views. Carol Ann actually had three different stories posted separately with quite different themes. They were not added together for the purpose of this summary. 4 – A photo of Super Connie #N6923C – RIP, 923 views. This was the actual Flying Tiger 923 on the tarmac of Gothenburg Torslanda airport in Sweden one year prior to the crash. The photo was provided by Ragnar Domstad who was then a junior at Chalmers Technical University in Gothenburg. He was an engineering student arranged chartered flights to the U.S. on the Flying Tiger Line. 5 – Who is in the photo?, 846 views. This was a group photo of random survivors and ship crew members on board the Celerina in the days after the rescue. 6 – Flying Tiger 923 and the Raging North Atlantic. While this is not a story, but rather a video related to the story, it has been very popular with internet viewers. To date, the video clip has had more than 2,000 viewings! Pierre Andre Raymond was a 19-year-old crew member on the Celerina who happened to have an old 8 millimeter movie camera with him on ship. He took three minutes of video of the raging seas just 12 hours before the crash, not knowing what excitement was to come. He gave us that film strip for public posting. Since the beginning of the project, many early viewers were satisfied with what they read and dropped off the radar. At the same time, many new viewers have discovered the site and have taken to viewing its contents. Therefore we will continue with the site in hopes of finding still more who were on board or the families of both those who died and those who survived. In summary, over the course of the past three years, the story of Flying Tiger 923 has risen from being virtually unknown to the world, to a site for thousands of people who were affected by the crash or who have an interest in airlines and air tragedies. Thank you for your interest and best wishes for a Happy and Healthy New Year! We look forward to 2015 and another year of spreading the story and hopefully picking up more stories related to the tragedy. Green fields plain to see. Low in the briny deep. At the time of the Flying Tiger ditching in the North Atlantic, Peter Foley was in the Air Force and had reached the rank of Senior Master Sergeant. He was assigned to the Stars and Stripes and was returning to his family in Germany after having completed a special reporting assignment in the United States. Peter Foley only days after the ditching and rescue. He managed to survive the disaster and was able tell the world about it. It was a shocking, violent, and grueling experience that lasted for days for everyone involved. As a news reporter, he bounced back nearly immediately to fulfill his mission. As Peter Foley’s daughter, I got to know him as a man with a long and colorful career and a loving dedicated family man. I am using this web site as a means of telling his story. 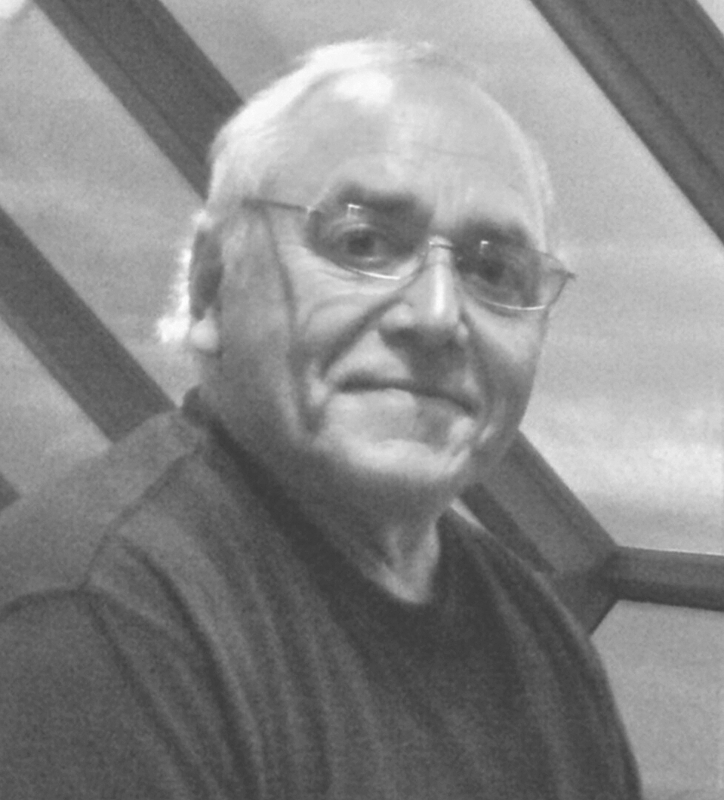 Pete Foley was a cheerful and vibrant man who loved life and had strong survival instincts. Those instincts were severely tested a number of times. As a very young man with a love of excitement, he joined the Merchant Marines soon after getting out of school in the late 1930s. After a brief stint of service, Peter returned to his hometown of Butte, Montana went to work in the copper mines that dominated city and its surroundings. He was a “motorman” and it was his responsibility to drive the ore cars in and out of the vast maize of dangerous tunnels being mined. He tells us that one day, a tunnel caved in, trapping many men inside. It was the “worst and the hottest” of tunnels in the mine. He escaped the disaster. Luckily, the trapped miners found an airway to crawl through until they reached a spot where rescuers could drop metal cages and pulled them out. 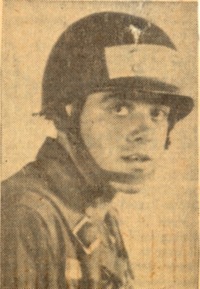 Pete later enlisted in the US Army Air Forces. During World War II, he worked as an airplane mechanic. He wasn’t in combat but again escaped death in 1945. Everyone on board was able to parachute out of the plane before it crashed. Pete described his free-fall through clouds and with birds, as a thrill – not a fright, and an experience that ended too soon. His parachute landing was smooth and something he “thoroughly enjoyed”. He served in Korea from May 1950 through June 1953. His decorations included the Bronze Star, the Republic of Korea Presidential Unit Citation, the Korean Service Medal, the United Nations Service Medal and the Air Force Commendation Medal. After Korea, Pete attended and was graduate of the Armed Forces Information School and the Strategic Air Command NCO Academy. In 1951, Pete married Mary Wallace of Helena, Montana in Yakahoma, Japan. Like many military families, the Foley’s had duty stations throughout the United States and the world. 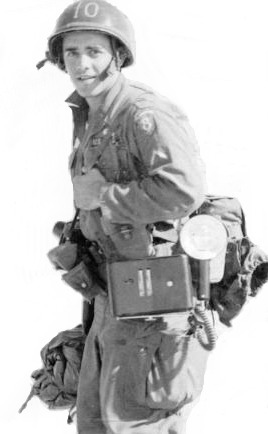 In 1962, after completing an assignment in Nevada for Stars and Stripes, the military newspaper in Europe, he boarded Flying Tiger Flight 923 to return home to his pregnant wife and five children in Darmstadt, Germany. As problems began to unfold, another passenger asked him if one of the four engines quit running, how the plane would fare. Pete’s response was to “stop worrying, this plane could fly forever”. “I was tired, dead tired. How easy it would be to quit fighting the sea and get it all over with. It would be so easy to die. Just stop fighting for half a minute. I shook my head, realizing this was a hell of a way to go.” I also knew how mad Mary would be if I didn’t return home. Whenever Pete talked about this plane crash, he would sadly mention the children; he never saw the girls after the plane hit the water. 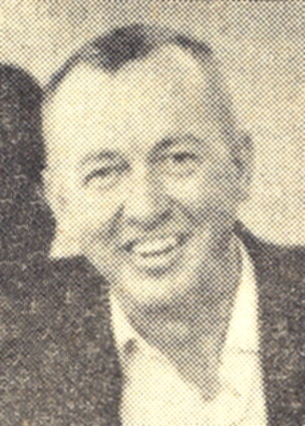 His family had to fly from Germany to New York, when he was transferred to Travis AFB in 1963. After his family boarded the plane, Pete went to airmen in the plane and made them promise to help his kids in case anything happen. He then introduced each airman to the child he was responsible for. Mary said she was sure most of the people thought he was a crazy old sergeant. 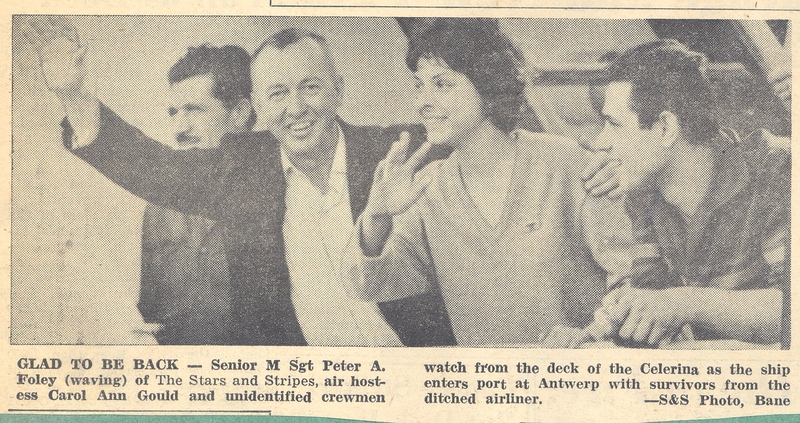 Peter Foley, 2nd from the left, waving to the gathering crowd as the rescue settles into port at Antwerp, Belgium. To his right is a fellow ditching survivor, air hostess Carol Ann Gould. To both edges of the photo are unidentified Celerina crew members who took part in the rescue of the lone life raft. Pete retired from the Air Force in 1965 and moved his family to Citrus Heights, California (a suburb of Sacramento). He was a smart person, loyal to family and friends, an enthusiastic supporter of his family activities, an adventurer, a teacher, a hard worker and a wonderful example of how to get a job done. He and his family were very active in community and school activities. They loved to travel, camp, boat, water and snow ski, ocean dive and always enjoyed a good party. In 1981, Pete and Mary bought a struggling business that supplies beneficial insects for pest control and turned it into one of the large supplier of ladybugs in the US. In 2001, Pete and Mary celebrated their 50th anniversary. Later that year, Pete lost his battle with melanoma and died in November. People often say they would die for someone they love. Pete’s character, however, was to focus his strength and energy on living for the people he loved and helping them to have a good life. Pete Foley lived a very good life. This story was first published on July 5, 2013, as written by his daughter, Teresa. She discovered this web site and soon thereafter discovered her father’s military career keepsake box. That gave her the material and incentive to submit this story. Site Editor’s Note: I became a news reporter while in the Army and while serving at Mainz, Germany as a paratrooper-infantryman. As a fledgling reporter (and still a paratrooper-infantryman, but on special assignment), I had come to see Peter Foley as a role model, even though he was no longer at The Stripes. He had been reassigned to other duty. Paul Stewart of Fisco, Texas surprised three of his fellow survivors with beautiful mementos of Flying Tiger 923. They were in the form of round table coasters etched in leather. The lucky recipients were former paratrooper Gordon Thornsberry of Russellville, Arkansas, former paratrooper Fred Caruso of Eagle, Colorado, and former Stewardess Carol Ann Gould Hansen, of Pequannock, New Jersey. Ms. Hansen was on the flight as a last minute replacement for a colleague who was not able to work as stewardess that day due to illness. 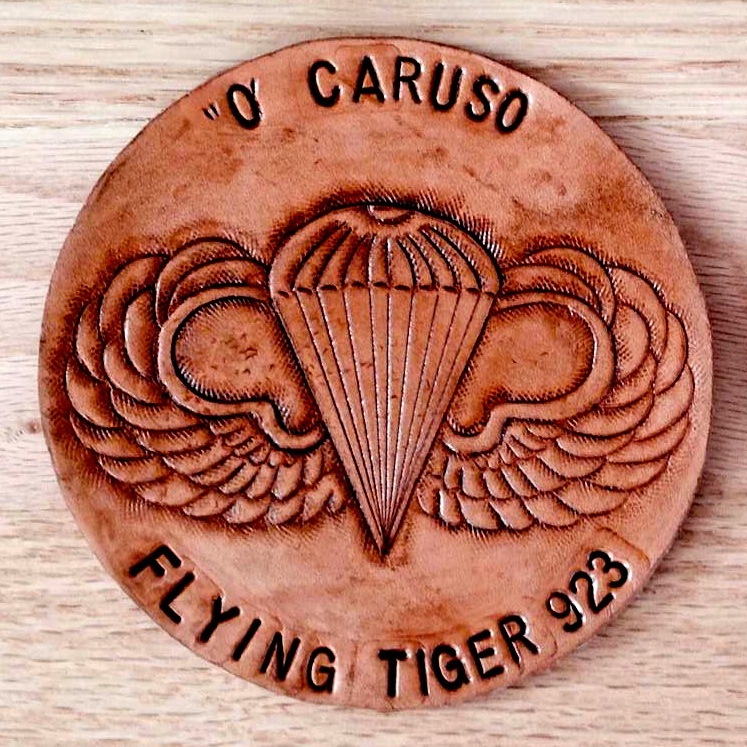 The two paratroopers, Thornsberry and Caruso, were in the same Army parachute unit as Stewart, all stationed at Lee Barracks in Mainz, Germany. The parachute wings are to specifically memorialize the airborne combat troops on board. Those troops comprised nearly half of all passengers on board. “Leather is a hobby, that I started years ago, and something that I really enjoy. Have only made things for family and friends. Started with belts, and when people saw them they wanted to buy, but as was working, and not having the time, I stopped doing leather craft for a while. “I like to make things that are sort of one of a kind – even made some western gun holsters for friends. Have never sold any of the items, and really never put any thought into any of that. Stewart hand stamps everything, including the image of the parachute wings. Each parachute wing has been hand cut. No embossing dyes used, except for lettering.